This condo is just a five-minute walk to Playas del Coco restaurants, the beach and Pacifico’s own shopping center. Enjoy the botanicals overlooking the oversized lap pool or relax inside the bright, open living/dining room area. Fully furnished 2 bedroom, 2 bath condo has appliances, granite counters & bar, central air/con, washer/dryer, wireless Internet, parking and security 24 hours. The condo features a 44" flat-screen TV in the living room and a TV in the master bedroom. The over-sized master closet allows for great storage and the two adjacent sinks in the master bath provides spacious accommodations in the mornings. The second floor balcony overlooks the impeccably manicured gardens and pool. Spacious balcony with cushy, comfortable furniture awaits you. Enjoy quiet evenings under the outdoor fan, while relaxing. 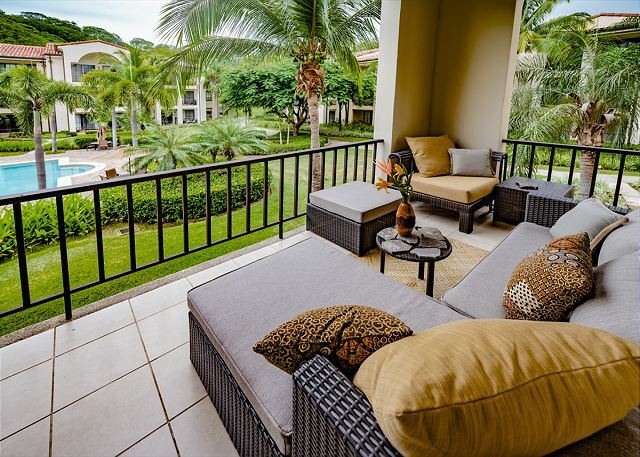 You will feel secluded and private but close to everything Coco has to offer! As a guest of Pacifico #L1109, temporary membership to the exclusive Pacifico Beach Club is available during your stay for an additional $70 a week per person(per condo). The Beach Club is located around 1 mile from the community and free shuttle is provided every day. This condo also has two bikes for use during your stay (no extra charge). This is perfect to get around Coco fast & efficiently. Very relaxing we loved our stay at Pacifico Condos. This was my 4th time renting. The condo was pleasant, but a bit cluttered for our taste. However, the deck is quite relaxing and has a pleasant view. The kitchen is efficient and reasonably equipped. The Concierge service was great providing good and efficient airport pickup/drop-off service, reasonable car rental rates and excellent tour service. They responded to inquiries, and problems right away. I will definitely return to Pacifico. Milagro is a great company to deal with. Jeffry is very professional and responds quickly to your concerns. He is also very fast acting and gets your questions or concerns handled very quickly and courteously. Pacifico is a great community...very clean and secure. Quedamos muy complacidos de la ubicación del condominio, del apartamento, del club de playa, fueron unas vacaciones magnificas y el apartamento estuvo muy confortable, teníamos todo lo que necesitábamos. Lo único que no estuvo bien fue la cama en el 2do cuarto, ya que es un sofá-cama, por lo que fue un poco incomodo la dormida. deberían poner una cama mas cómoda en ese cuarto. A pesar de eso, quedamos convidados a volver. The property was described as having the capacity to sleep four people. The second bedroom was small, and the bed really was not sufficient for more than one adult. Perhaps if some of the guests were children the space would be sufficient, but I really do not believe the property can sleep four adults with the smaller bedroom furnished as it is. The unit is attractively furnished on a modest budget. The kitchen is equipped with serviceable tools and equipment, and the dishes are quite nice.